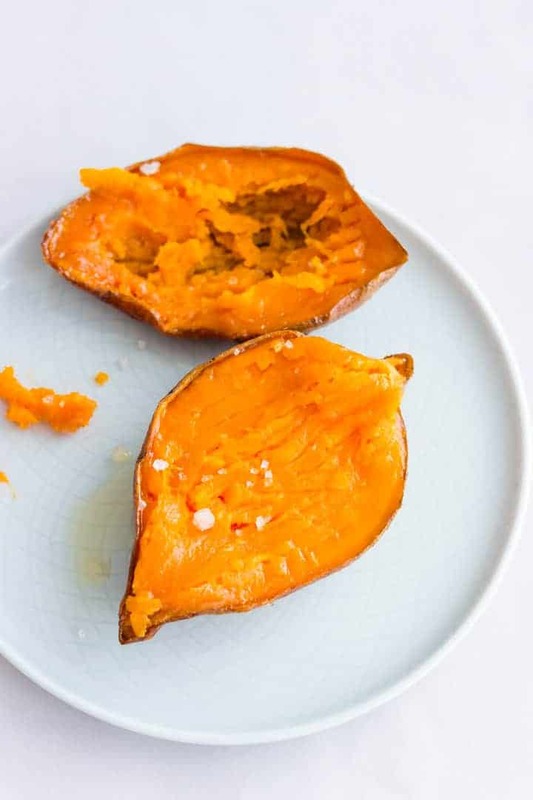 This is a basic recipe for baked sweet potatoes. The procedure is very simple and takes only 5 minutes to prepare. While they are in the oven, use the time to make a side salad or some veggies to serve with. Did you know that sweet potatoes are a good source of fiber and many vitamins? Also, they do count towards our five a day vegetables and fruit rule. As in comparison the white regular potatoes don’t. This is a good reason to try out this baked sweet potatoes recipe for the next dinner. I suggest you first try it out only served with butter and sea salt on top, which will melt right away on your sweet potato. You can even eat them for breakfast topped with banana and almond butter. Be creative! You might also like to try mashed sweet potatoes. 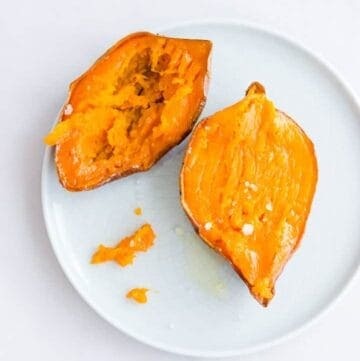 A basic recipe for baked sweet potatoes. They will be very soft after baking and have an intensely sweet flavor. Preheat your oven to 200°C/395°F (fan forced). Wash the sweet potatoes and cut them into halves. Rub them with olive oil, sprinkle with sea salt and lay them with the flesh side down on a baking tray. 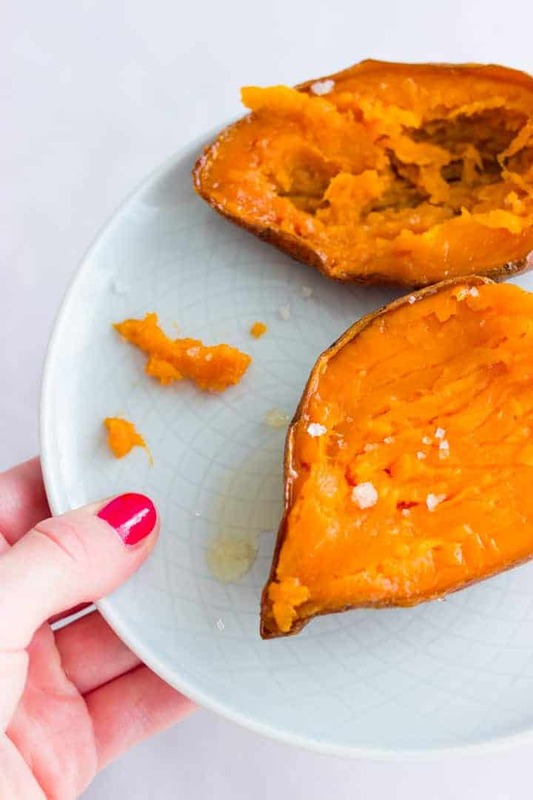 Bake your sweet potatoes in the preheated oven for 35 minutes. Take them out and drizzle with the butter, it will melt right away. I like to top them with additional sea salt. You can serve them with a green salad or veggies. 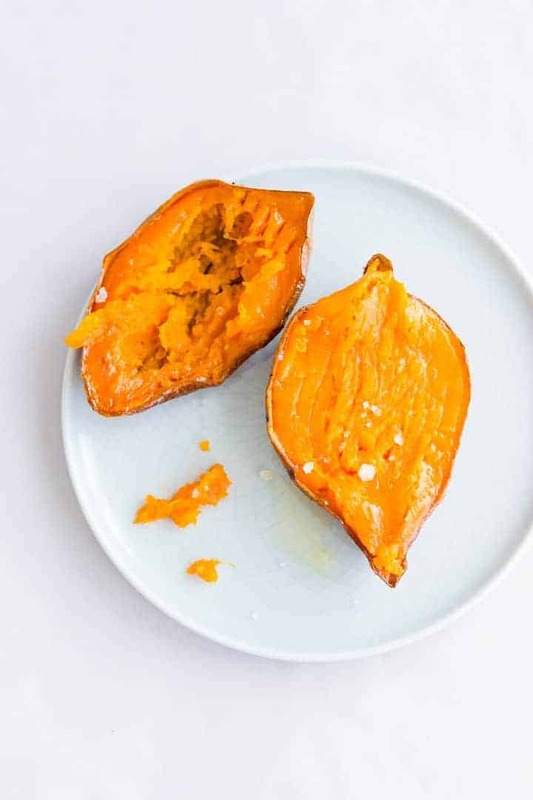 It's also possible to eat the sweet potatoes as a breakfast topped with banana and almond butter. I totally agree ? very simple to make, but they taste delicious! Sweet potatoes are everything!! Thanks for giving us a simple and delicious way to make them. You are welcome Kasey! I love that these sweet potatoes are so simple to make.